So I'm sure this will come up again, but I love being organized! I breathe a deep sigh of relief knowing what we are having for dinner in a week, knowing that the food is already in the fridge, knowing I will not have to drag two tired children through the store at 4 p.m. to get the ingredients for supper. While some might look at my organization binder and think I'm clinically crazy and wasting a ton of time, I feel like it's my way to have maximum time with these littles. This binder holds my brain. Seriously. If you're ever heard me rant about it before, you know how lost I would be without it. 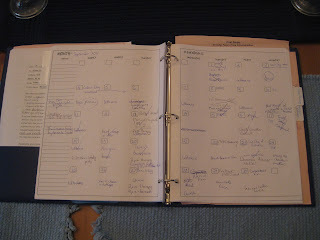 I have all our family's information and schedules in different sections plus my calendar and meal planning lists. 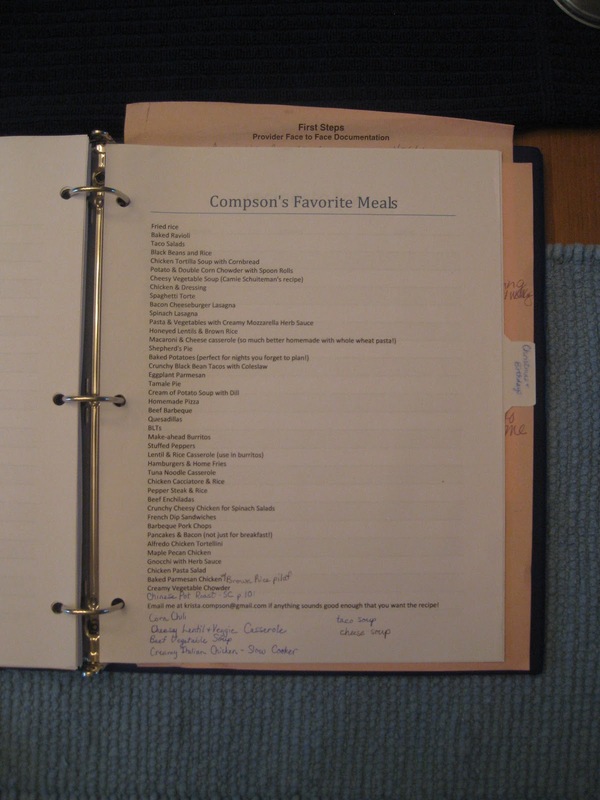 I used to have a separate sheet for my menu, but I found that it was just easier to put the meals on the days that I would be making them. Plus, then it's much more obvious which nights I will be able to cook and which ones we'll need to pull something out of the freezer. Ah.. freezer cooking...another obsession. The key to using this calendar and menu planner is that I MUST look at it first thing in the morning. I think one day at a time. I might start using Tsh's daily docket to help me out. 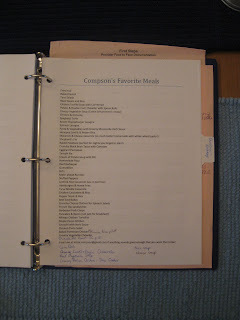 I wrote out some of our meals for a friend but then discovered that I should have done this long ago for myself. This list is constantly growing, but these are tried-and-true meals that I know my husband and I (and Benjamin since he'll eat anything including carpet) will enjoy. Here's my weekly calendar. When it's a crazy week, Teacher Man and I will use this calendar to pow wow about how we're going to balance littles, ministry, work, and life while still (hopefully) smiling. Really, this sheet just gives us a great communication tool so that we don't have any not-so-fun surprises during the week. 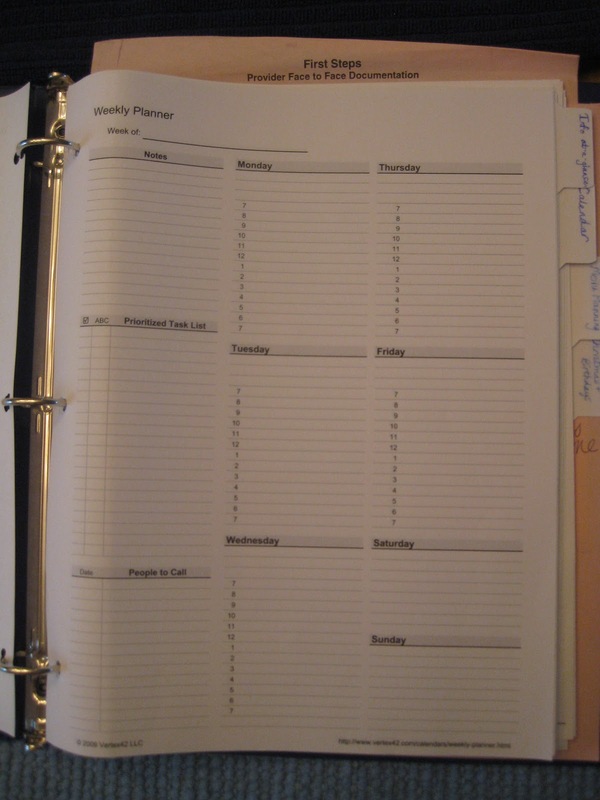 Plus, we can also use this calendar to realize if we're over-committed and need to reorganize some commitments. 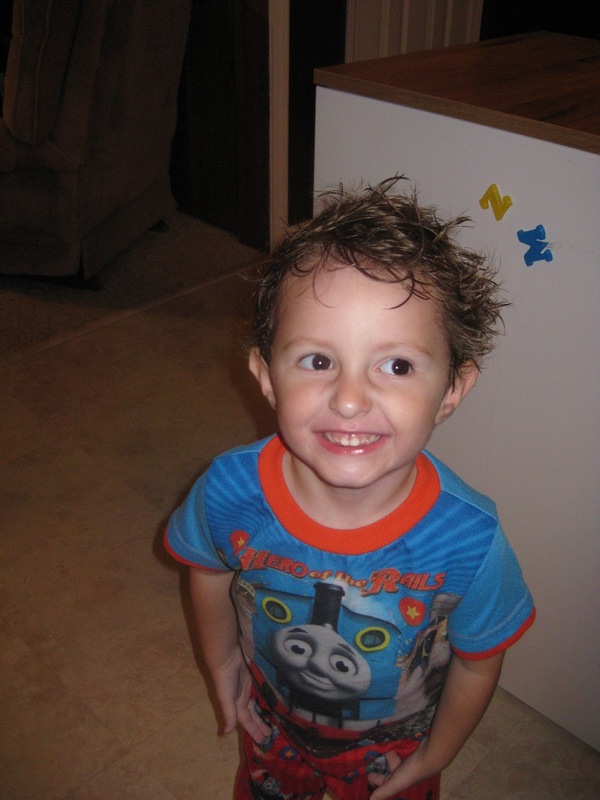 As much as I love organizing, I love the order that it brings to our daily rhythms more. 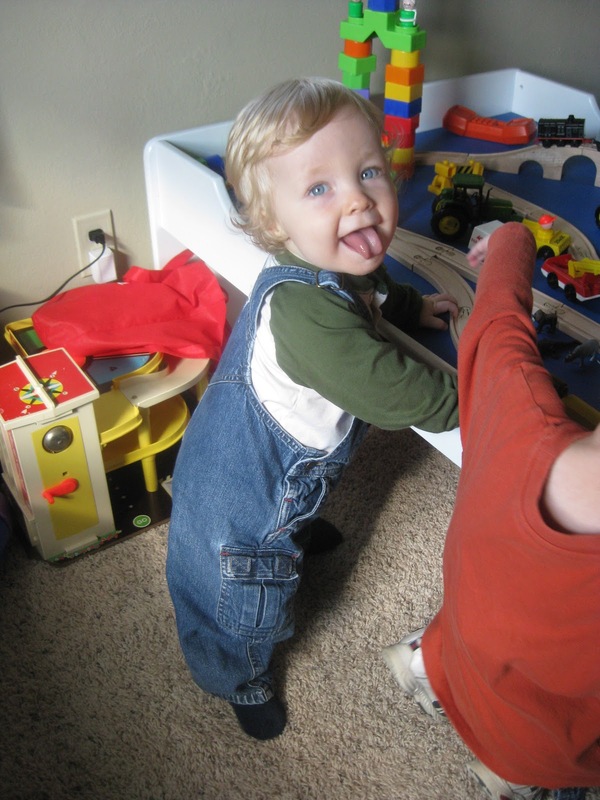 Less hurry, less worry, more play, more people. It helps me keep the eternal as my priority since the daily concerns have been thought through. We know there will be time for our children, time for our marriage, and time to sleep. Amen. And amen. Looking good. 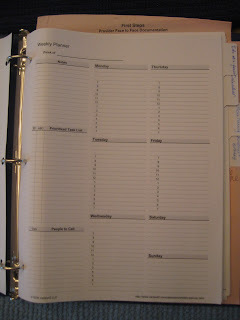 I use a planner...much like I did in school. I just never got out of the habit. It looks like one of those student planners. It will fit in my purse. Oh, there's another thing...I actually carry a purse now. This is a new thing for me. 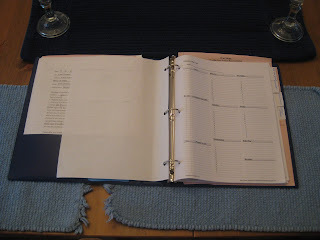 What is the advantage to a binder over a regularly-sized planner? @Ann, I'll have to post more on this in the future because I've gotten a few other clarification requests. Basically, I like the fact that I can create the pages myself and design the book to fit my needs and the way I think. Right now, my binder has sections for emergency info, babysitter info, medical info, birthdays/Christmas lists, calendar, menu plan, weekly plans. And I hate purses so I never have mine with me. More to come soon!